The intention of this article is to provide additional comment and examples, relating to the article about the eigenvalue function, and above all the meaning of its results. Having provided simple instructions on the function, this article is aimed at undergraduates and those interested in revising the subject with Dymola as a tool for study. We will take the example of the humble inverted pendulum. The key physical observations are that moving further from the equilibrium will cause still further departure, but that faster motion, generates a restoring force. This is reflected in the results, and the discussion of “eigenvalues” and “eigenvectors” connects directly to it. 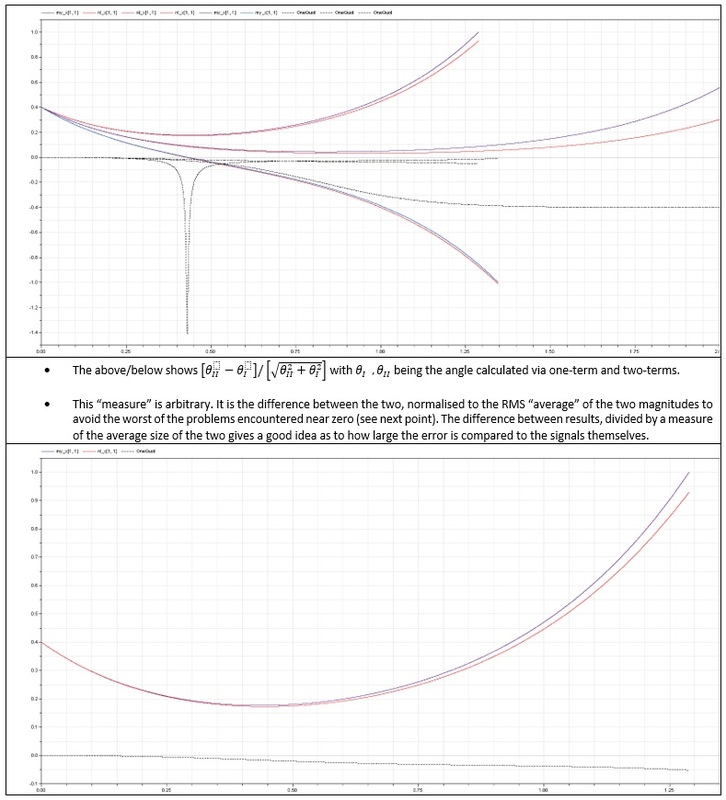 The other key thing to bear in mind, however, is that the linear model is only useful with theta near zero. We investigate the necessary linearisation later on, and illustrate how Dymola can just as easily plot progressively more accurate versions of such a simple system by using more Taylor terms than only the first (linear) term we are used to from high school physics i.e. for small due to the (exact) infinite series expansion for Sine. 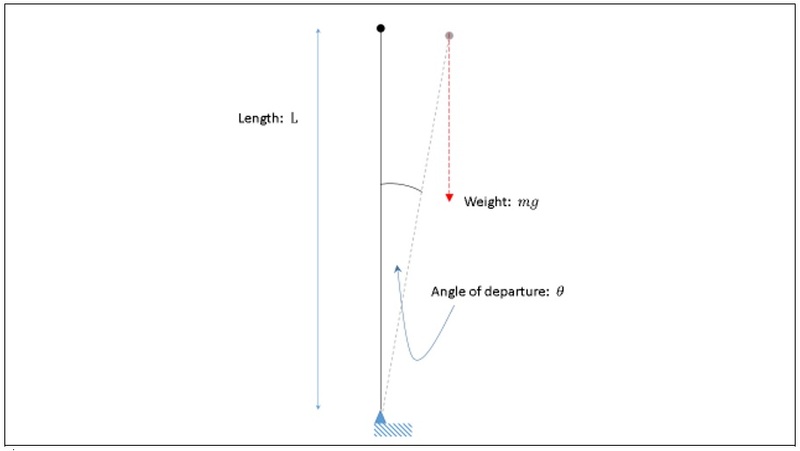 Applying the Dymola eigenvalue function to matrix A for a damped, inverted pendulum produced the trajectories shown in Figure 2. Note the way the trajectories converge on the eigenvector with negative real eigenvalue towards t=-∞, and on the positive-eigenvalue eigenvector towards t=+∞. The eigendirections are labelled with dotted lines, with the arrows indicating the direction of advancing time. The axes are angular distance (that is, angle through which the pendulum has moved from the vertical) and angular speed, (that is, how fast the pendulum is rotating/falling). It is therefore a hodograph. The two trajectories represent the same initial conditions, but with reversed signs. In other words, the trajectory below begins on the right, and behaves as the antisymmetric mirror image of the one above, heading first toward the origin (losing speed, and reducing angle from the vertical) then away again. A trajectory starting at the origin would, if programmed in Dymola, result in no trajectory at all, however this phase-space analysis shows that any tiny deflection from the origin will cause the system to diverge along the arrow heading away from the origin (toward the top right, or bottom left, depending on the direction of any initial perturbation). The eigenvalue function shows this easily. A starting position on the horizontal axis means an initial displacement, with no velocity. Starting on the vertical axis represents an initial velocity, with no initial displacement (pendulum pointing up vertically). Origin point: the location representing the pendulum standing totally still, balancing vertically. Any displacement or motion will result in departure along the eigenvector. 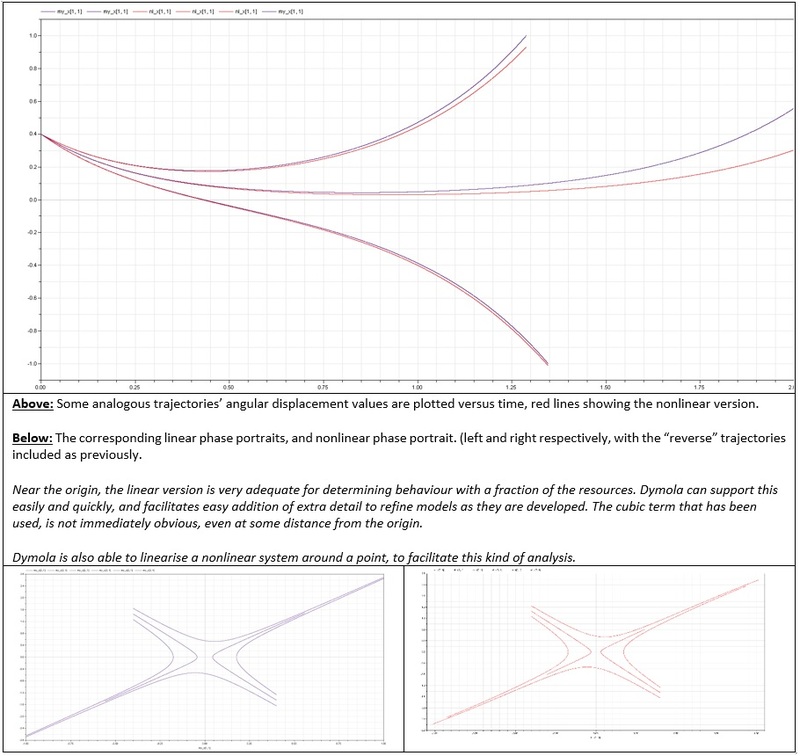 The trajectories extend from an initial displacement of (+, – respectively) 0.35rad and (- or +) 1rad. The extremes representing zones where the linearised model isn’t valid for the familiar, but simplified example chosen. Nearer the origin, the behaviour in Figure 2 closely represents that of an inverted pendulum. Up until now, we have used the approximation that is approximated by the first term of it’s series expansion, . This is very neat, as it makes the system linear, and is a good approximation for small values of the angle. Using the approximation i.e. using one Taylor term only. One can progressively add additional terms to improve the approximation, and we can use Dymola to compare the appearance of the trajectories. Figure 4. Several trajectories (i.e. the same system with different initial conditions) with the one-term, and two-term displacement (i.e. angle of departure from vertical) values plotted against time. The “non-linear” two term values, so called because they have a non-linear term, are plotted in red. Figure 5. Above, three other trajectories with a normalised error measure included for each (all black dotted). Below a single trajectory and error signal isolated for ease of viewing. This section is included to try to connect the mathematical concept to the world of experience. This is easier with some examples than others, but I have gathered a few insights that are helpful to me to assist in making it less abstract. 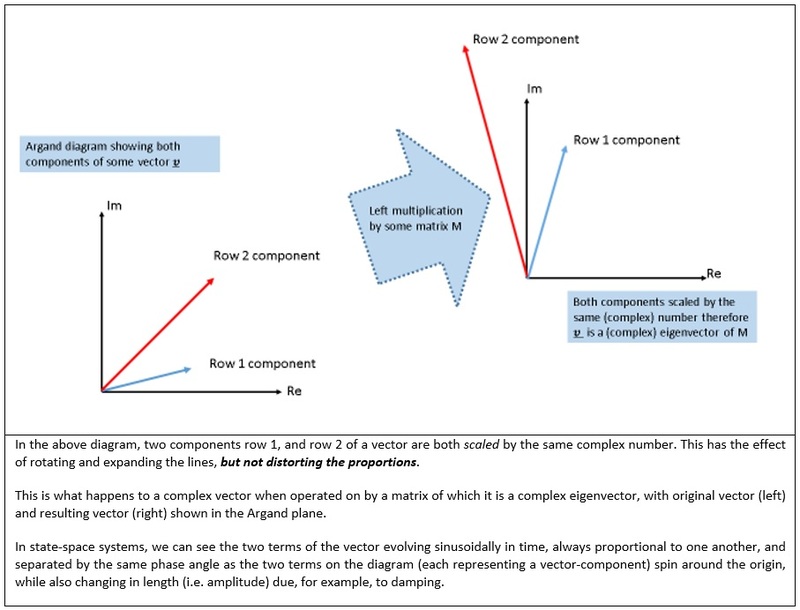 The diagram below illustrates the “scaling” relationship between the vector before left multiplication by the matrix, and after. When the eigenvalues are real, it’s easy to see that a vector grows only in length if it is an eigenvector of the multiplying matrix. With complex eigenvalues, rotation occurs purely because the multiplying factor is a complex number. Nonetheless an eigenvector before and after left multiplication will still be scaled by the corresponding eigenvalue – scaling by a complex number is merely a more complicated concept. If a square matrix of size n has n independent eigenvectors, then a matrix of eigenvectors will diagonalise the matrix. The associated eigenvalues will appear on that diagonal in the same order as the matrix of eigenvectors’ columns. There is no point in space where all three planes cross; two or more are separate, but parallel. The response of dynamic models, systems with purely real eigenvectors are much more easily modelled (Adhikari & Srikantha, 2008) than those where this is not the case (Inman & Lallement, 1995). This influences the choice of damping model, and has precipitated research to discover acceptable forms for models. This is connected to the fact that in vibration analysis, every natural frequency of a discrete dynamical system is associated with a “characteristic motion” or “mode shape” (Inman, 2001). Those mode-shapes are given by the eigenvectors of the linear (or linearised! 3) system, posed in homogeneous form. Rotation matrices also provide eigenvectors physical meaning. In this case, the single real eigenvector is along the axis of rotation generated. The other two (if 3D) will be a complex conjugate pair that fix the angle of rotation. The eigenvectors of mass-inertia tensors are the “principal directions”. This is essentially equivalent to the statement that the matrix of eigenvectors diagonalises the matrix of moments-of-inertia. Further approximated as a unidirectional vector field not a central force. This normalisation is there to avoid dividing by zero so that the graph turns out more informative. The reader will notice there is still a spike where the two quantities get close to zero, because their RMS average also gets pretty small. Though not sophisticated, tricks like this are important to avoid discontinuities or “events” in explicit simulations. Dymola has a facility to linearise a system around a given operating point, amongst other things to facilitate linear control-theory based examination of the response, like root-locus analysis. Adhikari, S. & Srikantha, P. A., 2008. Rayleigh Quotient and Dissipative Systems. Journal of Applied Mechanics, p. 6. Boyce, W. E. & DiPrima, R. C., 2001. Elementary Differential Equations & Boundary Value Problems. 7th ed. Troy, NY: John Wiley & Sons Inc..
Inman, D. J., 2001. Engineering Vibration, Second Edition. Upper Saddle River: Prentice Hall. Inman, D. J. & Lallement, G., 1995. A Tutorial On Complex Eigenvalues. Orlando FL, Society for Experimental Mechanics. Lay, D. C., 1997. Linear Algebra & It’s Applications, Second Edition. Boston MA: Addison Wesley. Ruijgrok, P. i. d. G. J. J., 1990. Elements of Airplane Performance. Delft: Delft University Press. Various, 2015. http://www.netlib.org/lapack/. [Online] Available at: http://www.netlib.org/lapack/[Accessed 22 December 2015]. Wakker, p. i. K., 2001. 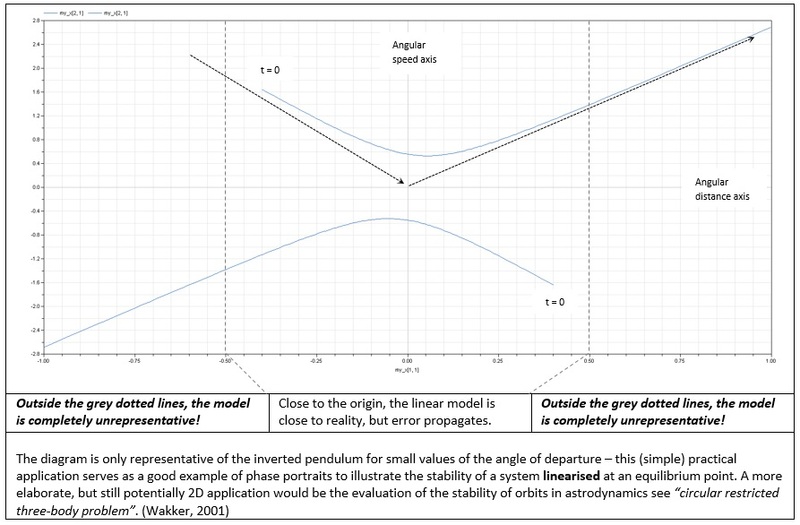 Astrodynamics Lecture Notes – AE4874 I. Delft: Delft University Press.